Capsule Summary: Its spring at the 4077th and love is in the air. Klinger wants to marry his girl back in Toledo while Radar falls for a nurse. Meanwhile, a grateful soldier won’t stop protecting Hawkeye. There’s a lot going on in this episode. Almost too much. It’s hard to say whether there’s an A story and a B story or just a bunch of relatively equal stories so I’m not going to try. Hawkeye has a guardian angel in the form of a grateful Marine named Lyle. Klinger gets married to Laverne with the help of Radar, Father Mulcahy, and Colonel Blake. Radar falls for the lovely Lt. Simmons. And there’s also a wounded soldier with a cat. With all that’s going on, it’s surprising (or perhaps not surprising) how little Trapper has to do in this episode. He’s not really involved in any of the storylines but pops up in all of them. Even Father Mulcahy is given more to do–he plays a part in both the Hawkeye and Klinger storylines. Margaret and Frank stand around and shout, infuriated at everything they see. Frank is also twirled around in the air by Lyle. Radar’s storyline is vaguely reminiscent of “Love Story” from Season 1, only it ends on a happier note. In that episode, Radar tries to appear cultured to attract the attention of a sophisticated nurse but ends up being bored by her. In “Springtime,” after learning Lt. Simmons enjoys quiet evenings reading poetry, Radar brings her chocolate and offers to read her some poetry. It works and she throws herself at him. It’s interesting that two episodes in Season 3 involve some sort of ceremony being performed in the 4077th with the second participant far, far away. “Springtime” had Klinger’s marriage ceremony with Laverne in Toledo while “Life with Father” had the Jewish circumcision ceremony with a rabbi on an aircraft carrier. Although “Life with Father” aired two weeks after “Springtime,” it was actually produced before it. Did the producers worry at all that the storylines would seem repetitive? Lyle’s obsession with Hawkeye is amusing. Alex Karras does a fine job portraying the hulking Marine as a sensitive brute who wants nothing more than to do good things for the doctor who saved his life. I wonder if additional scenes involving the soldier-with-cat were cut from the script or the episode during editing. It’s never really resolved. On the other hand, it could’ve just be a plot point for the Hawkweye/Lyle storyline and there was nothing more to it. The closing credits include a credit for a character named Pasco played by Greg Mabrey. Perhaps Pasco is the unnamed soldier with the cat? Radar doesn’t want to talk to his Uncle Trapper and Aunt Hawkeye. This was the second of three episodes penned by writing partners Linda Bloodworth and Mary Kay Place. The first was “Hot Lips and Empty Arms” from Season 2; the third was “Mad Dogs and Servicemen” from later in Season 3. Bloodworth also wrote two episodes on her own. There has to be a story behind Mary Kay Place getting cast as a guest star in an episode she co-wrote. I’m not being critical of her performance, which I think was quite good, I’m just curious how it happened. At the time the episode was produced, she had just two acting credits to her name. Perhaps another actress was originally cast but at the last minute had to drop out and there was no time to replace her? 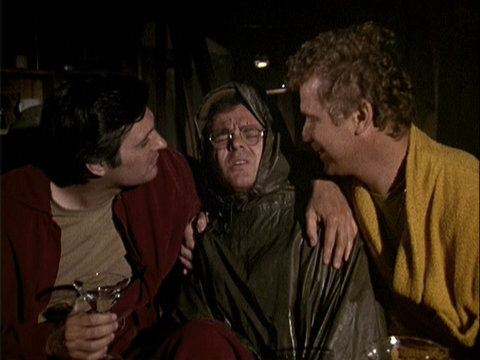 Patricia Stevens isn’t credited for her appearance despite having two lines during the scene in which Hawkeye meets the unnamed soldier and Fluffy. Gwen Farrell and Kellye Nakahara are likewise uncredited. I don’t recognize the two other nurses grouped around the bulletin board looking at the volleyball schedule. KLINGER: COLONEL BLAKE! My girl, Laverne! She said “yes!” She agreed to marry me! HENRY: Klinger, has she ever seen you? KLINGER: We’ve been dating since high school, of course she’s seen me! HENRY: I mean recently, you look like you just blew out of GONE WITH THE WIND. LYLE: Say, Doc, I’m shovin’ off tomorrow, and I thought I’d get your home address. Maybe we can be pen pals after the war. HAWKEYE: Lyle, it would just be boring for you, I write everything in prescription. That and. . . .
LYLE: Lyle bad person. Does bad things. HAWKEYE: No you’re not. Lyle good, Hawkeye bad. I guess they figured since Mary Kay Place co-wrote the episode (and I believe I read somewhere she was wanting to focus solely on acting at one point) they just went ahead and cast her as Lulu Simmons. Speaking of which, not only did Radar fall for Lt. Anderson in “Love Story,” but the same plot came up again in Season 7’s “Hot Lips is Back in Town,” where Radar fell for Linda Nugent. I have a tendency to repeat that line every once in a while whenever I see something that just isn’t believable. Thank you Colonel Blake for that great line! And the writers thereof. My favorite line, excellently delivered by Mac! I feel like this is an excellent example of the fun early episodes! So much going on but IMO it all works seemlessly. So many good quotes from this one!